BLACKFIRE Clay Lubricant has a polymer-rich formula allows clay to glide over the surface without sticking or scratching. The clay lubricant provides a slippery coating between the clay bar and the paint to protect the paint from grit picked up by the clay. The lubricants condition synthetic clay bars to extend their usable life. 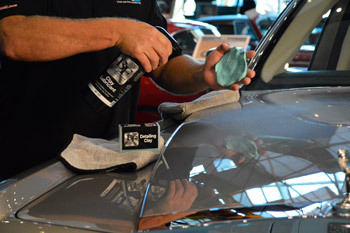 Cleaners in BLACKFIRE Clay Lubricant remove clay residue as you work, keeping the paint cleaner and helping to create that "smooth as glass" surface. To work properly, all clays require a lubricant. Soapy water will work in a pinch but it provides only minimal paint protection and the detergents in some soaps can break down the clay causing it to disintegrate. Only a true clay lubricant will preserve the clay and protect your vehicle. BLACKFIRE Detailing Clay Lubricant is specially designed to work with all clay bars, natural or synthetic (new PolyClays). BLACKFIRE Clay Lubricant creates a microscopic barrier between the paint and the clay cleaning material. The high lubricity formula prevents loosened contamination from scratching delicate clear coat finishes yet it will not break down or degrade the integrity of the clay. When you are finished claying mist BLACKFIRE Detailing Clay Lubricant on your clay bar prior to storage. This will help prevent the clay from drying out and keep it supple until its next use. If clay residues resist easy wipe-off, re-mist the cleaned area with BLACKFIRE Clay Lubricant and wipe with a clean microfiber towel. Even stubborn residues will wipe off easily. This is a true dual-action product that makes claying cleaner, safer, and more effective! Mist a small area (2 sq. ft.) of the vehicle and rub the clay bar over the surface. The clay will "grab" at first. Continue lightly rubbing the clay over the surface until it moves freely. When the bar moves freely, the surface is clean. Wipe off any residues with a towel and proceed to the next area.